2,8 kW, 230 VAC / 13 A / 50 Hz, 12 VDC / 8 A, 3000 rpm, 1,04 ltr./kWh, 12,5 ltr. fuel tank capacity, electronic starter, forced air cooling, AC plugs, DC connectors, monitor, breaker. 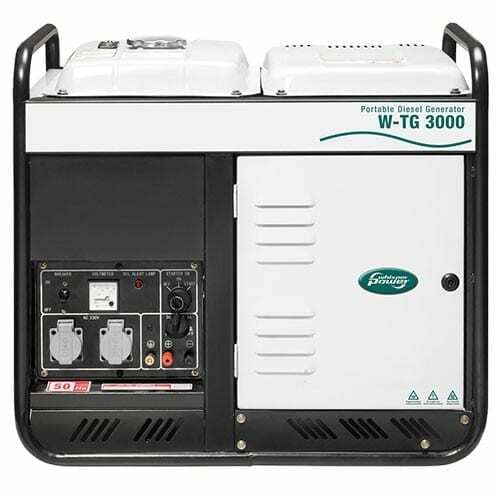 The Portable Diesel Generator Whisperpower W-TG 3000 is fully self contained (fuel tank, starter battery, exhaust) and ready for operation. For fast power up to 2,8 kW the air cooled W-TG 3000 brings a low cost solution. In 2009 Hybrid Power Systems BV was founded to develop and produce combined hybrid power and propulsion systems for superyachts and commercial vessels. Since 2010, the product portfolio has been significantly expanded with products and components which form complete electrical systems for vehicles, vessels or locations which do not have (permanent) connection to the public grid. They can be assembled for plug and play solutions. WhisperPower has used its years of experience in developing systems containing a diesel engine to develop in-house, a new generation of power electronics. The product range covers power range options from 500 watts to 500 kW. Join our ZERO Home Bills Community. The BEST Products from the BEST Brands at the BEST Retail Prices by Solaranna on ZEROhomebills.com.